Scuf Gaming sent over one of their best controllers for a product review on ThisGenGaming, and I’m going to say it right away that this controller might be one of the best custom controllers that I’ve ever used. I’ll go into why throughout the review, but I wanted to just throw that out there first because it was my overall reaction when I finished testing the controller for the review. 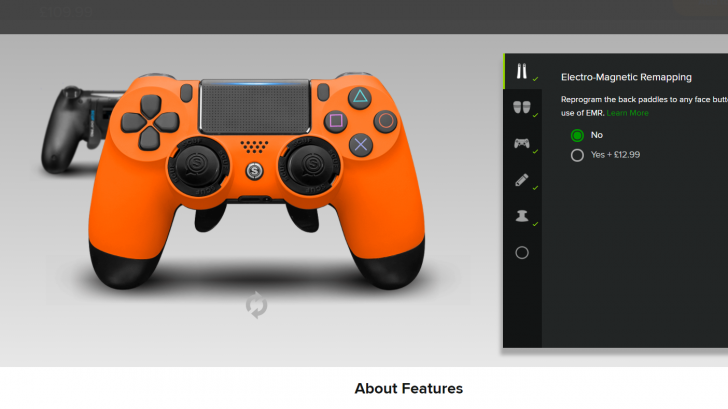 If you’re looking for a great custom PS4/PC controller then find out why Scuf Gaming’s Infinity 4PS might be for you. The controller is extremely comfortable for long gaming sessions, and has one of the best grips I’ve ever had for a custom controller. Scuf highly praise their own grip, and mention how it’s similar to the grips used for military weapons. Scuf’s controller also has its own paddle control system which has become popular with recent pro controllers. The use of these two extra buttons are implemented perfectly, and feel comfortable, and natural for the controller, rather than it feeling like something that’s just been connected on. The controller has many great custom elements to it, with one of my favorites being the quick shift trigger lock, which stops the trigger from going all the way down which allows for rapid gun fire, and is perfect for shooters games. I tested this with many of the recent FPS releases like Call Of Duty: WWII and it was working great for me, and I preferred it to the old non stopped trigger system. Another feature involving the triggers is the trigger extenders which come with the controller and allow for a custom trigger experience, if you prefer longer triggers than you can have that with this controller. If you are looking for a custom controller for the PS4 or PC then Scuf Gaming deserves your attention. The Infinity range is extremely impressive, comfortable and affordable. Gaming sessions will never be the same once you use a controller by this great and trusted company. As it gets closer to Christmas, Scuf Gaming’s controllers should be on your radar! If you want to purchase a controller make sure to check their range out here!